Jinhua Pigs are from the Zhejiang Province in China.The have a white body, with black at the head and rump. This leads to the common name of two-end-black. Their back and loins are slightly curved. They have thin skin, fine bones, and tender meat. 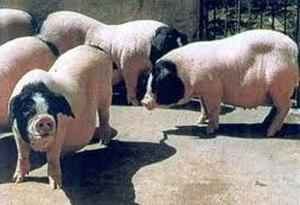 Jinhua pigs mature early and may be mated as early as 3 to 4 months old. They are fairly prolific with an average litter size of 13 and seven pairs of teats. After special processing, Jinhua ham is considered to have a unique and delicious flavor.